Welcome to your complete guide to graduations at Lackland Air Force Base. This is an exciting time in the life of your airman and we endeavor to provide you with the most comprehensive graduation information available for Lackland AFB. Graduation schedules and events are published below to aid you in scheduling your attendance at your airman's graduation. You will find many cost effective options for traveling to Lackland Air Force Base. You will be able to review the complete details on the many hotels available to meet your lodging needs. The greater Lackland Air Force Base area provides many options for dining ranging from fast food to full service restaurants. Be sure to check out the information on the many attractions available for sight seeing. 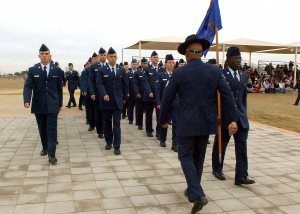 Lackland Air Force Base does not publish a schedule of graduations. Basic Military Training graduations from the Air Force are conducted every Friday. The events surrounding graduation begin on Thursday and last through the weekend. For complete graduation details and schedule of events please click here. Graduation dates and times shown here are subject to change. Be sure to communicate with your airman for the most up to date information concerning graduation locations and times before making travel arrangements. Lackland Air Force Base is located in Texas on the west side of San Antonio. Click here for more information on air, bus, and train transportation for Lackland Air Force Base. Lackland Air Force Base is also known as Joint Base San Antonio-Lackland or JBSA-Lackland. Due to security measures that are implemented at Lackland Air Force Base you may experience delays getting onto the base. Be sure to allow for extra time to make sure you arrive at the graduation event on time. Family members and/or friends attending graduations that are arriving here by motorcycle must have in their possession a Motorcycle Safety Foundation Card. Without this card motorcyclists will NOT be allowed to ride on base. 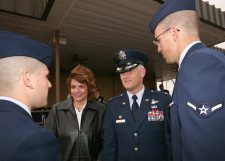 A background check must be accomplished on all family and friends of trainees attending Air Force Basic Military Training (BMT) graduation events. All recruits must complete the Visitor Access Request Letter and hand carry it with them to BMT. This will save training time, avoid processing delays, and prevent unnecessary travel expenses for family members denied access to Lackland AFB. Visitors planning to attend BMT graduation week events are highly encouraged to purchase refundable/transferable tickets in the event they are denied access or in the event their recruit's graduation date changes. Also, all guest(s) 18 years old and over must have a photo ID. Recruits do not have to request access for anyone: a. With a valid DoD Card (e.g., common access card, retired military ID card) this card grants them access to the base. b. Under the age of 18 they may enter the base when escorted by an adult who is granted access. What to wear to a graduation ceremony? Your airman will be dressed in a Class "A" uniform which is the Air Force's formal uniform. You may wear want you want from casual to your Sunday's best. Pass Policies vary by unit and depending upon the next destination of your airman. Please see unit for details on passes after graduation.